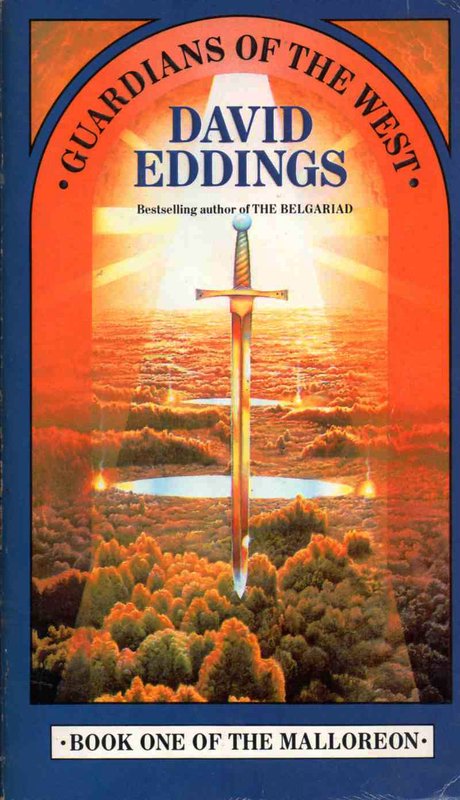 Paperback covers #9: Geoff Taylor’s covers to The Belgariad | 'TAIN'T THE MEAT… IT'S THE HUMANITY! 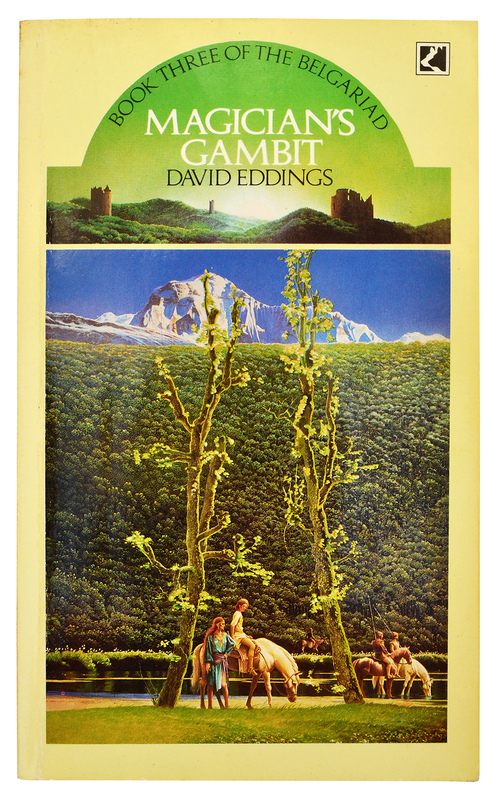 Time for another look at some of my favourite book cover illustrations. 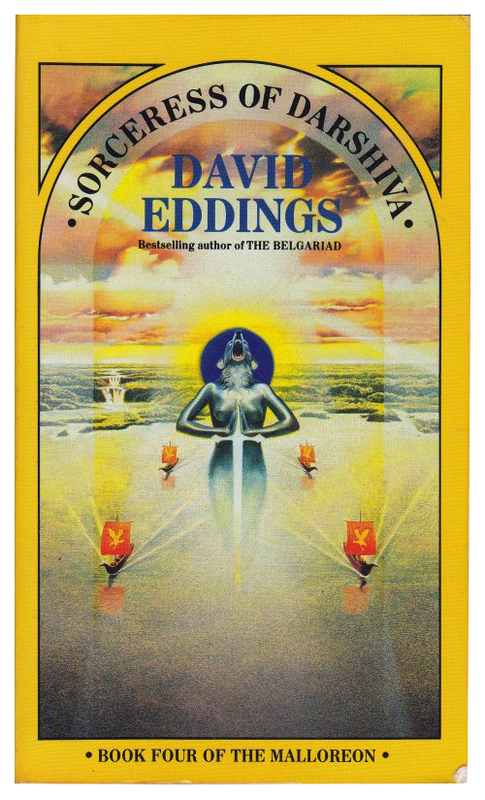 This week it’s the turn of Geoff Taylor’s covers to the UK editions of The Belgariad, the best-selling 1980’s fantasy series by David Eddings. 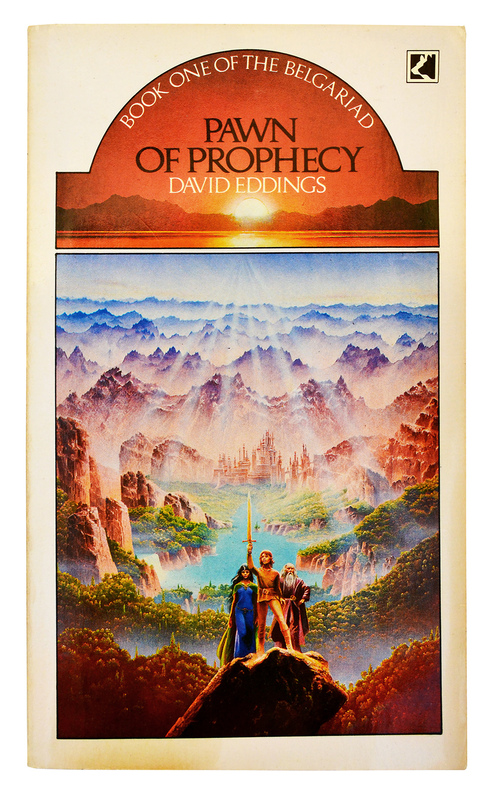 The back cover to the first UK edition of Pawn of Prophecy. 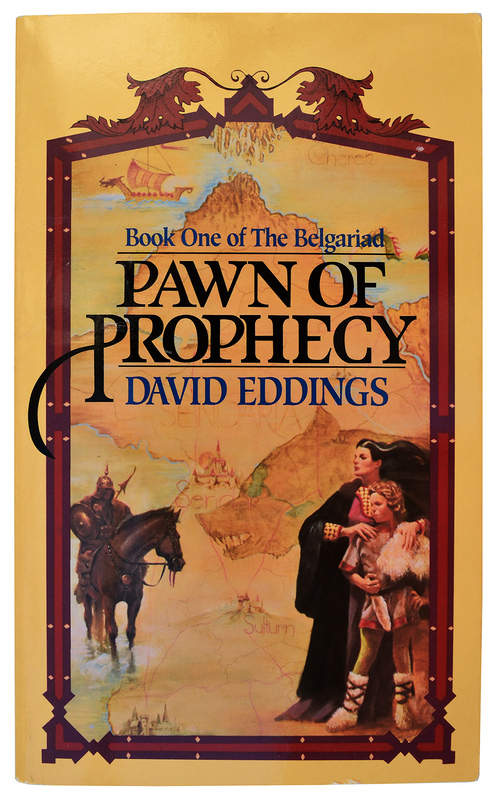 I was first introduced to Eddings’ fantasy series The Belgariad in 1983 when the first novel in the series, Pawn of Prophecy, was published in the UK by Corgi Books. 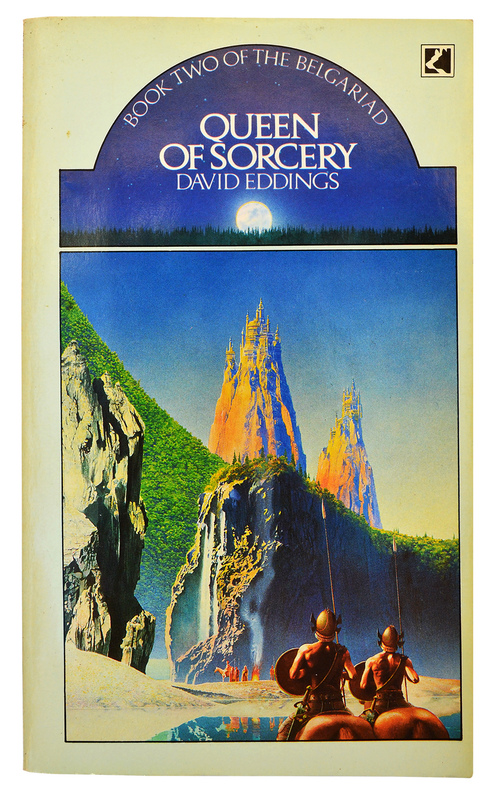 Although I was a fan of the fantasy genre I had never heard of Eddings until I saw the novel in a bookshop in Northfield in Birmingham, and was immediately attracted to the cover. 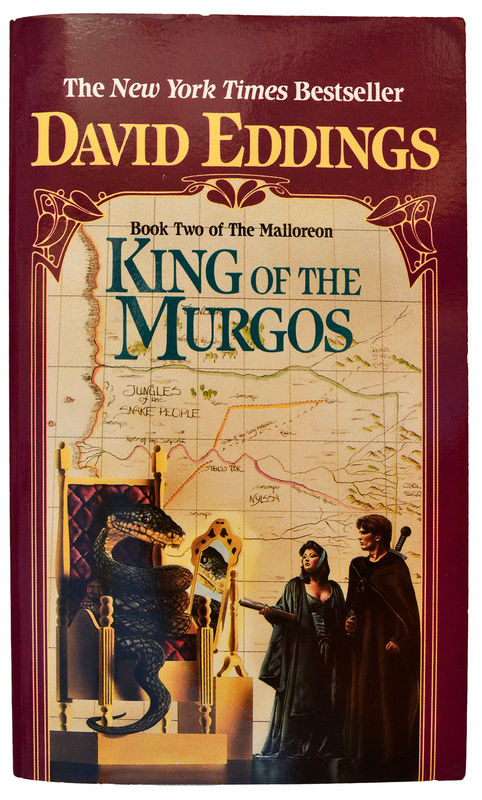 Apart from the eye-catching illustration I remember been drawn to the book because it was the first in a sequence of five, and I thought it would be fun to immerse myself in a fantasy series. I purchased the book, started reading and quickly found it compulsive, a genuine page-turner. 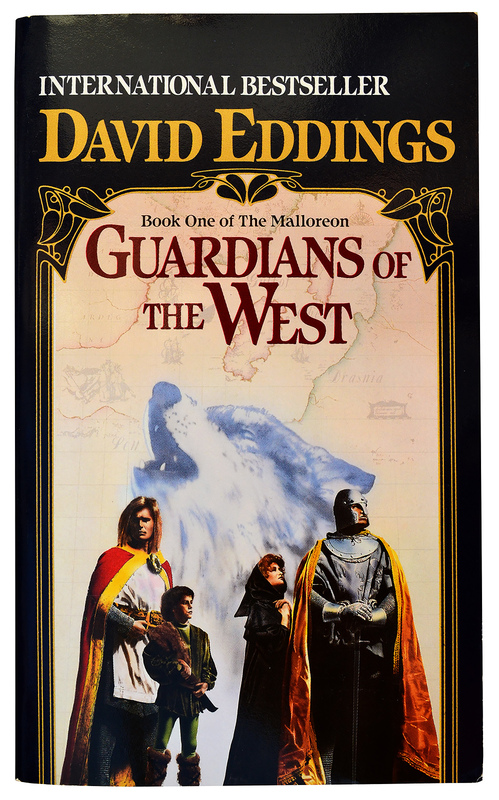 The story of the young orphan Garion, his extended group of friends and their attempt to overthrow the evil God Torak gripped me from page one. 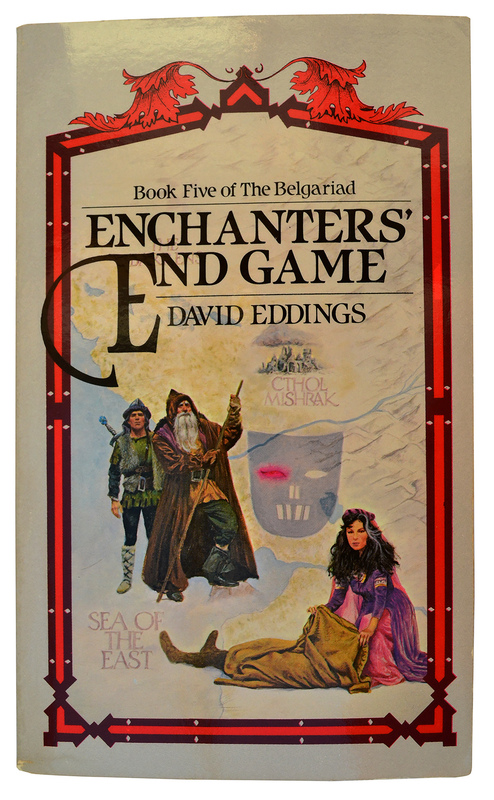 I thoroughly enjoyed the novel and the subsequent four novels in the series: Queen of Sorcery, Magician’s Gambit, Castle of Wizardry, and Enchanter’s End Game. 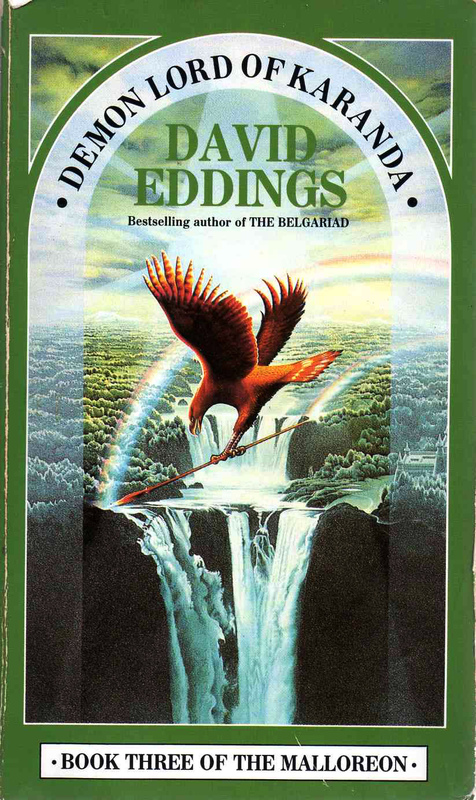 The Belgariad became an international bestseller and quickly catapulted Eddings — and his wife Leigh with whom he collaborated — into the top tier of 1980’s fantasy novelists. 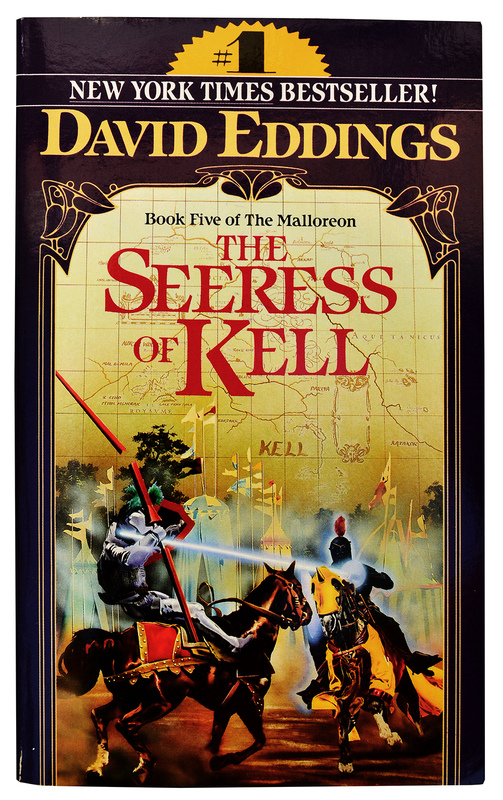 A second series of five novels, published under the umbrella title The Malloreon (Guardians of the West, King of the Murgos, Demon Lord of Karanda, Sorceress of Dharshiva, and Seeress of Kell) followed a couple of years later, along with three other books set in the same fantasy universe — Belgarath the Sorcerer (1995), Polgara the Sorceress (1997) and The Rivan Codex (1998). 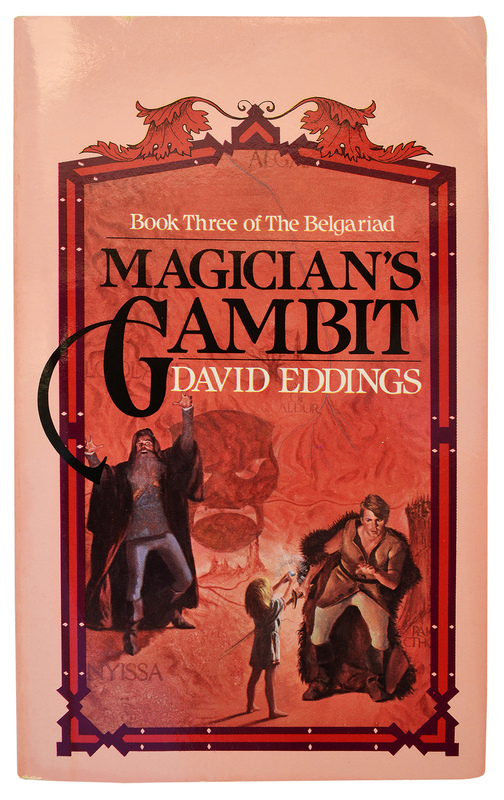 One of the secrets to the success of The Belgariad was not only did Eddings’ create a large and believable fantasy world, he populated it with relatable characters who you genuinely cared about. 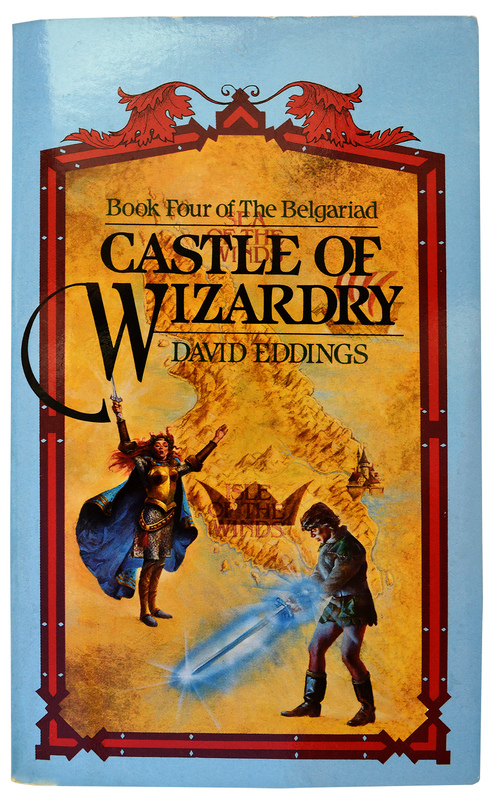 I recently revisited The Belgariad and rather enjoyed it, although I’ll admit a fair amount of my enjoyment stemmed from nostalgia. Don’t get me wrong, they’re well written books but they’re just not as hard-hitting and gritty as modern fantasy novels. 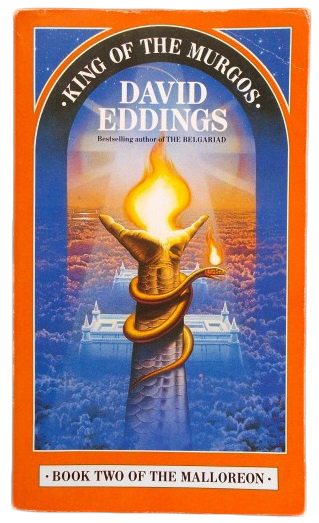 Although The Belgariad and The Mallorean are still in print they are now firmly classed as YA novels, which seems fair. As well as the UK Corgi editions of The Belgariad I also have their Del Ray counterparts from the US. 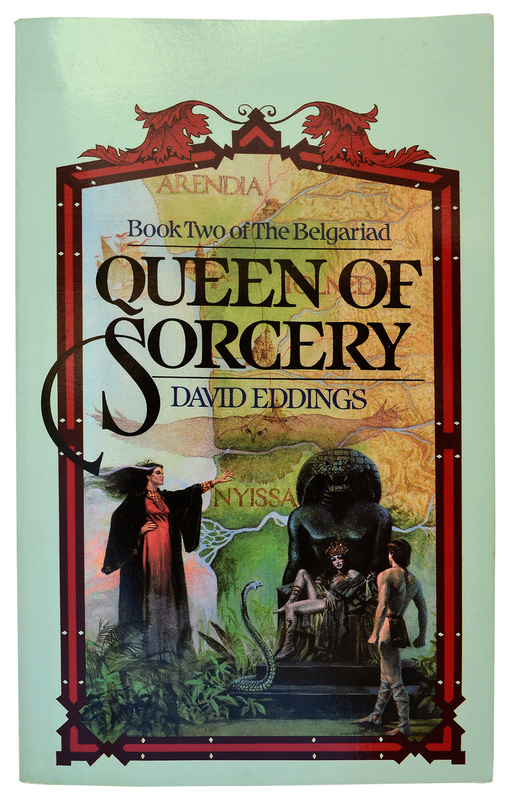 These covers were illustrated by Laurence Schwinger and it’s interesting to compare his work with Taylor’s. 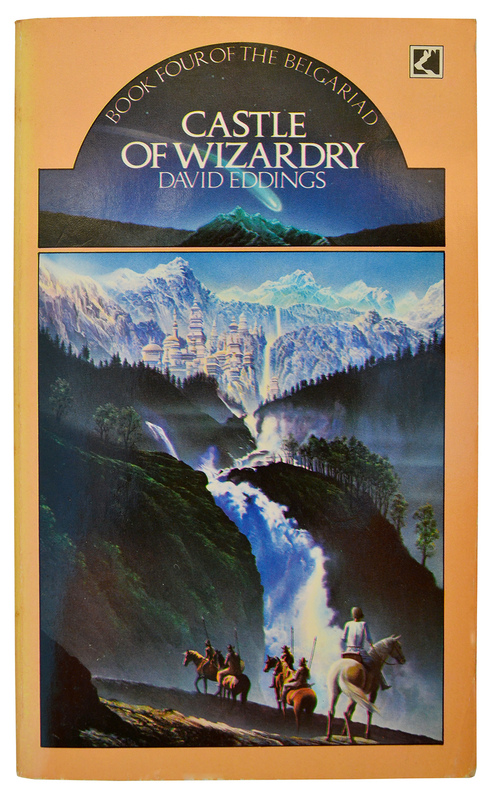 Schwinger’s covers are very much in the vein of other Del Rey fantasy novels from the 1980’s: heavy serif typeface; ornate border with a map in the background. However, Schwinger’s artwork made the characters look somewhat medieval while Taylor’s paintings emphasised the story’s fantasy elements to a greater extent. 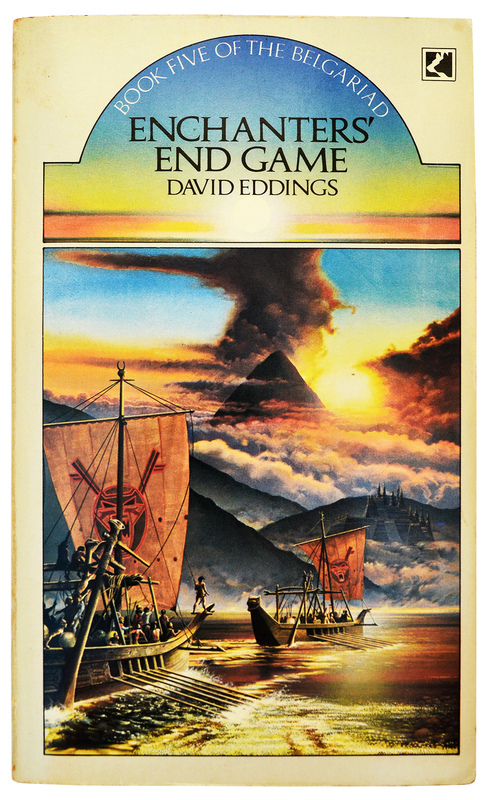 As accomplished as Schwinger’s work is I much prefer Taylor’s interpretation of Eddings’ world. 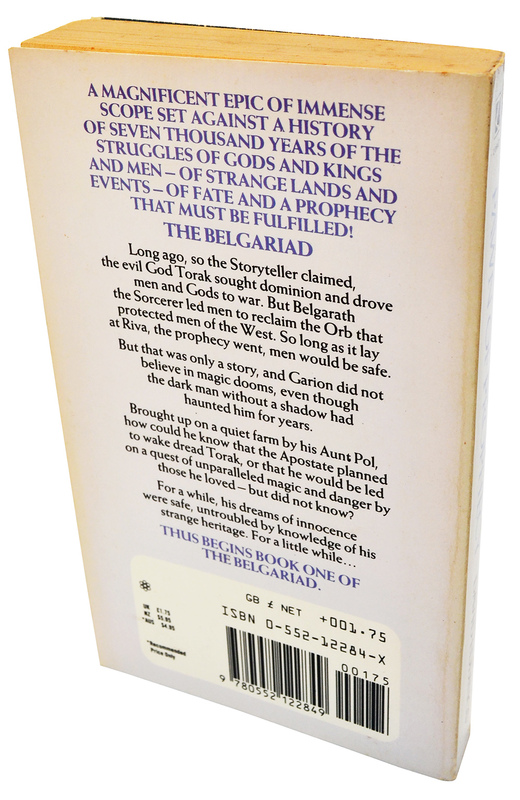 The Belgariad was repeatedly reprinted in the UK over the next decade and Taylor’s artwork was reused several times. 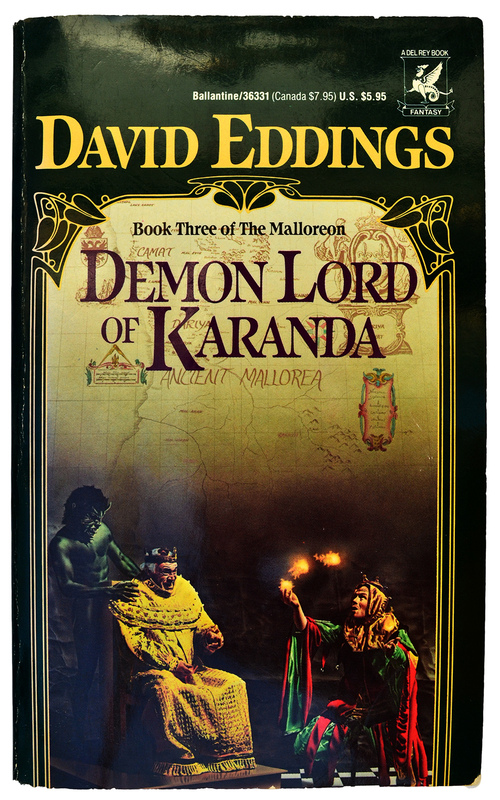 Sadly the typography was changed, and to my eye these covers aren’t as successful as the original paperback editions. 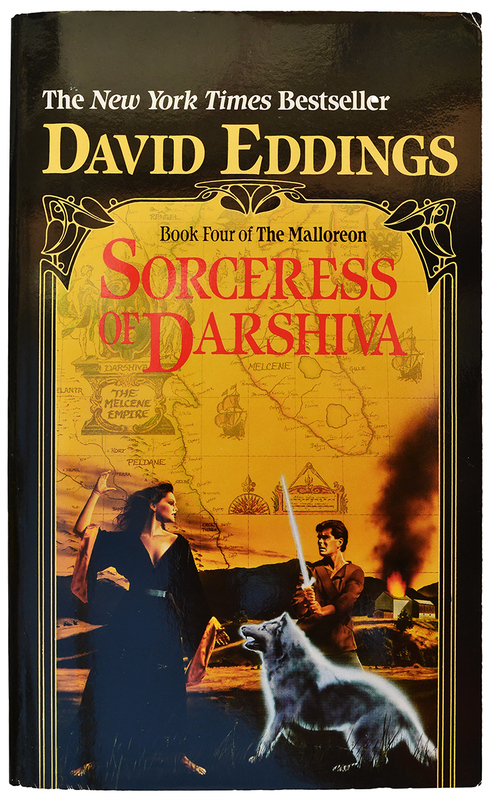 Taylor also illustrated the covers to the UK release of The Malloreon, although I didn’t find his artwork that time round to be quite as effective as it was with The Belgariad. The decision to focus on various magical objects instead of scenes from the novels just didn’t work for me, and these covers fall a bit flat. I’ve included them below — see if you agree with me. Finally, I have the somewhat uninspired US editions of The Mallorean, also published by Del Rey, and illustrated by Edwin Herder. Herder’s work is OK but he really over-emphasised the medieval elements, and these covers are just a little too bland for my taste. 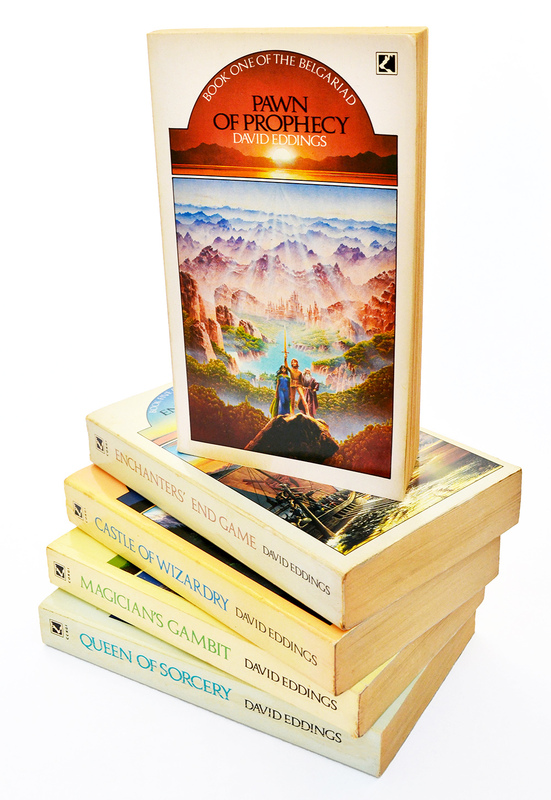 The five Corgi Books editions of The Belgariad are some of the oldest books in my collection and I wouldn’t part with them for anything. 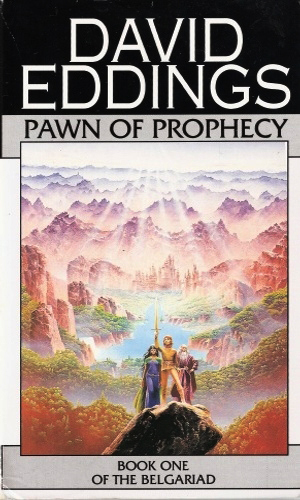 I still have very fond memories of the first time I read them, and clearly remember the first time I saw Pawn of Prophecy in that bookshop over 30 years ago. 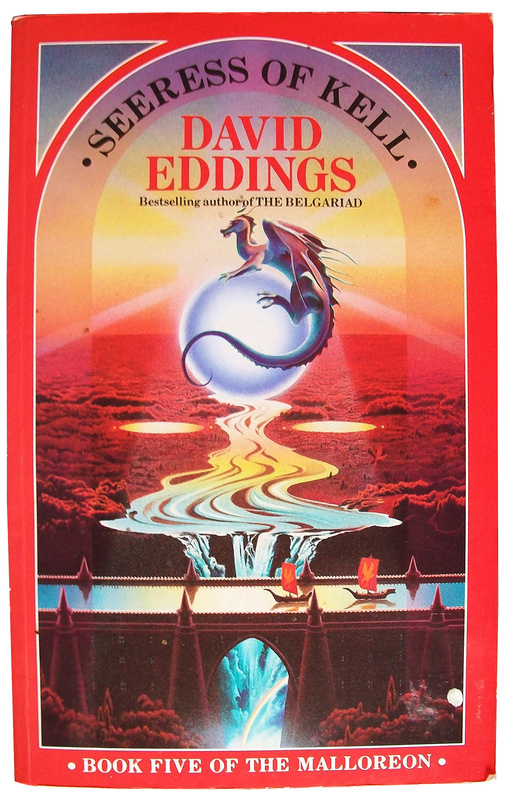 I remember that, even though I knew nothing about the books or the author, I loved the cover and shelled out most of my precious (and meagre) pocket money for a copy. Sometimes judging a book by its cover can really pay off.